Plush, comfortable, versatile and stylish. This piece is an understated luxury. A welcoming statement lounge chair that can still the scene as easily as it can blend in a variety of style environments. Each piece is made to order. Studio and COM fabric options available. This re-edition is sanctioned by the family of the designer. SORS Paris collection. A swivel feature for this lounge chair is now available! Swivel feature now available for an up-charge. Many manufacturer and COM fabric selections are available. Pricing varies depending on fabric selection. Painted wood base color options : Peal Gold or Black. Price varies depending upon your fabric choice. Cream color fabric in primary photo chosen specifically to honor the design original. Folding cane rattan and blackened mahogany folding lounge chair, modern revival of a colonial lounge design. Un-dyed natural full cane lounge chair. Tones of the unvarnished cane may vary. 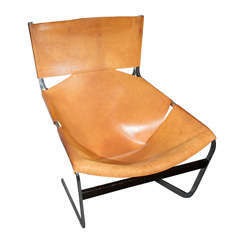 Pierre Paulin Artifort chair in natural leather. Early Pierre Paulin "Big Tulip lounge Chairs". Produced by Artifort, France 1960's. Chairs have newer white fabric. Rare lounge chair 'F444' by Pierre Paulin. Manufacturer by Artifort. 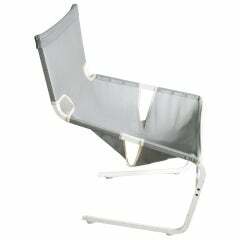 White painted steel and gray mesh seats. Stunning original condition and complete with the 'cover' for the top.